AMI Aero has been a leading provider of engineering services to commercial aviation and the defense community since 1971. AMI Aero’s engineers and program managers have expertise in a wide range of disciplines and are available to efficiently support your program at a variety of levels. Aircraft Design and Configuration - AMI Aero maintains a full suite of preliminary design methods for the sizing and assessment of new aircraft configurations. AMI Aero maintains a comprehensive set of predictive methods: drag prediction, engine cycle analysis, arbitrary mission performance analysis, takeoff and landing performance (Balanced Field Length), static stability and control, dynamic stability and control, nDOF flight dynamics simulation and handling qualities assessment. AMI Aero subject matter experts (SMEs) are practiced in low-speed and transonic airfoil and 3D shape design. Business and Commercial Aircraft - AMI Aero has decades of experience supporting a wide range of development and certification programs. 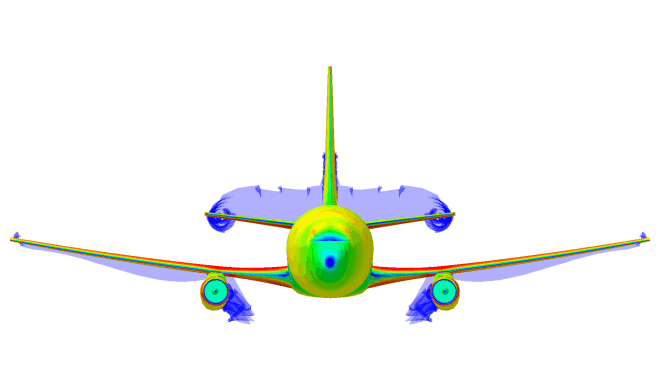 AMI Aero engineers leverage a comprehensive suite of Computational Fluid Dynamics (CFD) methods, in-house analysis tools and an extensive analytical and experimental background to offer a tailored and cost-effective solution to your problem. AMI Aero is responsible for the aerodynamic configuration of several business jet aircraft including; Sino-Swearingen SJ30, Eclipse 500, and Spectrum S40. Commercial aircraft modifications include; re-engine programs, radome and antenna installations, strake installations, wing modifications, winglet designs, and more. Radome and Antennae Modifications - AMI Aero has supported a multitude of aircraft modification programs. AMI Aero has experience designing external modifications to minimize risk for bird-strike, vibration and buffet, ice accretion, effect on aircraft handling qualities and performance. Defense Related Capabilities - AMI Aero has decades of experience supporting a wide range of defense related programs; from new UAS designs to special mission aircraft modifications. AMI Aero engineers leverage a comprehensive suite of CFD methods, in-house analysis tools and an extensive analytical and experimental background to offer a tailored and cost-effective solution to your problem. AMI Aero has supported a multitude of special mission modification programs. We provide aerodynamic design and certification support. Modification programs include; re-engine programs, radome and antenna installations, strake installations, wing modifications, ISR shapes, turret installations, and more. Computational Analysis Services - Already have an engineering capability? AMI Aero can support your engineering staff with turn-key CFD services using any of our in-house and 3rd party tools. We can provide solutions from a variety of methods ranging from 3D panel methods to full Navier-Stokes. AMI Aero utilizes cloud-based computing. We can address problems on a scale typically reserved only for the largest of corporations. Aircraft Geometry Definition - With due attention to fidelity requirements, AMI Aero has decades of experience in the technique of reverse-engineering to produce 3D models of aircraft outer mold lines (OML) using a variety of sources. AMI Aero provides turn-key 3D model development using laser-scan and other metrology techniques. This includes development of smoothed aerodynamic lofts from noisy laser scan data. AMI Aero maintains a database of over 400 aircraft configurations; developed using AMI Aero geometry acquisition methods and available for use on your program. Testing Services - AMI Aero and our partners offer a range of testing services including low and high-speed wind tunnel testing and flight test support. AMI Aero’s analytical expertise is augmented by an extensive experimental background. Likewise, AMI Aero engineers utilize our computational toolkit to minimize the cost of a test program and can significantly minimize program risk and cost through a hybrid test and analysis program. AMI Aero can provide turn-key design-analysis and testing services, including wind tunnel model development, test support and analysis. AMI Aero can provide flight test support including test card development, instrumentation plans and flight test data reduction. Certification - AMI Aero has supported numerous STC programs and is well respected at Aircraft Certification Offices (ACOs) throughout the country. AMI Aero is located nearby to the Transport Aircraft Directorate (TAD) Seattle field office and ACO. AMI Aero can support your 8110 requirements using our network of DERs: Damage Tolerance and Fatigue, Flight Analyst, Flutter, Icing, Loads, Noise, Powerplant, Rapid Decompresion, Stress, Vibration and Buffeting. AMI Aero has developed FAA accepted methods to assess the potential for impact to baseline aircraft type compliance and is the co-author of several issue-papers.